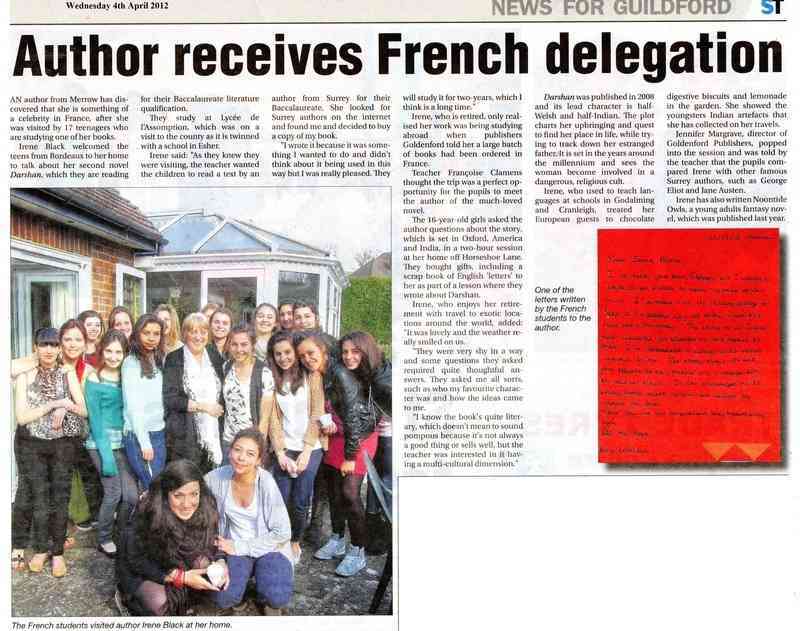 AN author from Merrow has dis­covered that she is something of a celebrity in France, after she was visited by 17 teenagers who are studying one of her books. Irene Black welcomed the teens from Bordeaux to her home to talk about her second novel Darshan, which they are reading for their Baccalaureate literature qualification. They study at Lycee de 1'Assomption, which was on a visit to the county as it is twinned with a school in Esher. Irene said: "As they knew they were visiting, the teacher wanted the children to read a text by an author from Surrey for their Baccalaureate. She looked for Surrey authors on the internet and found me and decided to buy a copy of my book. "I wrote it because it was some­thing I wanted to do and didn't think about it being used in this way but I was really pleased. They will study it for two-years, which I think is a long time." Irene, who is retired, only real­ised her work was being studying abroad when publishers Goldenford told her a large batch of books had been ordered in France. Teacher Francoise Clamens thought the trip was a perfect op­portunity for the pupils to meet the author of the much-loved novel. The 16-year-old girls asked the author questions about the story, which is set in Oxford, America and India, in a two-hour session at her home off Horseshoe Lane. They bought gifts, including a scrap book of English letters' to her as part of a lesson where they wrote about Darshan. Irene, who enjoys her retire­ment with travel to exotic loca­tions around the world, added: "It was lovely and the weather re­ally smiled on us. They were very shy in a way and some questions they asked required quite thoughtful an­swers. They asked me all sorts, such as who my favourite character was and how the ideas came to me. "I know the book's quite liter­ary, which doesn't mean to sound pompous because it's not always a good thing or sells well, but the teacher was interested in it hav­ing a multi-cultural dimension." Irene, who used to teach lan­guages at schools in Godalming and Cranleigh, treated her European guests to chocolate digestive biscuits and lemonade in the garden. She showed the youngsters Indian artefacts that she has collected on her travels. Jennifer Margrave, director of Goldenford Publishers, popped into the session and was told by the teacher that the pupils com­pared Irene with other famous Surrey authors, such as George Eliot and Jane Austen. NB Irene added: Retired...? Where did they get that from? Writers never retire, do they?